Launched in 2003, the Bionic Paddles with their distinctive ribs were a patent worthy innovation. In the meantime, they have become proven classics. Over the years we have worked on small details and made improvements. Since we also mount the Bionic Easy on the HE shaft, it drives much better. On the one hand the stiffer shaft transmits the force more directly, on the other hand the surface is finely ground and lies wonderfully in the hand. We offer the Bionic kayak paddles with three different sized blade surfaces and two material combinations in each paddle. Paddling is a pleasure – put together your Bionic Paddle according to your individual inclinations. Despite the highest demands on material and craftsmanship, it is always our goal to provide our customers with an affordable quality paddle. With the Bionic easy models for 210,00 € and the HE version, our best-selling Bionic paddle for 245,00 €, we succeeded. When paddling, you perceive nature and can draw ideas from it. It offers constructions that have been developed over a long period of time, tested under strict conditions and confirmed by their existence. It makes sense to use ideas from nature to move within it. The development of the paddle series Bionic for whitewater and playboating therefore followed exactly this idea. The special feature of the Bionic Paddle is the construction of the spine. Instead of the conventional central rib, several narrow ribs were stretched out like fans, similar to the feet of water birds. This framework strengthens the entire paddle blade up to its edges and stiffens it noticeably. Lower weight and improved power transmission are the benefits of this design. Due to the stronger stiffening of the back of the leaf, the canoe uses the entire leaf surface and thus transfers its power into the water in a controlled manner. The translation is much more direct with the Bionic Paddle, the “catch” is more effective and the “slippage” is reduced. The Bionic Grip has the largest blade area of the trio, the end of the blade is particularly large. This gives the paddle a great catch and a lot of pressure when dipping into the water. Creek bikers and well-trained paddlers with corresponding reserves of strength appreciate this form. The Bionic flow is a real all-rounder. This blade also offers power transmission, especially in the HE version. It is by far our most popular paddle for whitewater and playboating. Whether weight, handling, handling, handling or pressure build-up – everything is very harmonious here. If you are unsure which hand size is the right one, you are seldom wrong with this cut. Many have chosen it so far, we are happy about the great feedback and the many Bionic Flow Paddles on the water – thank you very much. With crossover kayaks such as the Pyhrana Fusion, Dagger Green Boat or Liquid Logic Stringer XP, we have recently been able to inspire many with a flow in lengths of up to 209 cm -212 cm. We are happy to offer these special lengths. The Colibri is the smallest and lightest of the Bionic models. Jochen Mergner, many years very active in squirt boat and playboating, knows the advantages of small leaf areas very well. 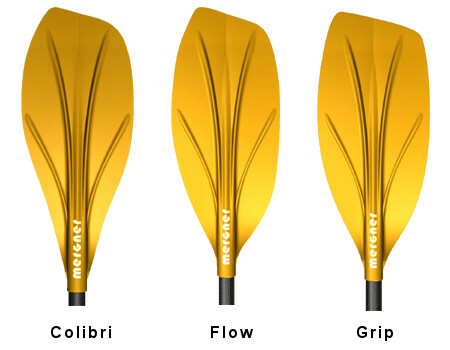 For paddlers with efficient paddling technique, the Colibri is an excellent stick for playboating: light, agile and easy on the joints, but also very little reserve when more pressure is desired on the blade – the Colibri is a special paddle. Certainly not recommended for everyone. Just right for flyweights, youth riders and all those who like a small blade area and high flapping frequency.